While I know the question of what to wear may seem silly to some, we take our autistic pride pretty seriously around these parts, and Katie has always embraced the opportunity to honor and celebrate her sister by wearing something special on Autism Awareness Day. She has, with Brooke’s endorsement, spoken to her classmates about autism ever since she was in third grade. And a big part of it, for her, is finding a physically visible manifestation of both her pride in her sister and her plea for understanding and support of those on the spectrum. “Lighting it up blue” – whether it be the house, our cars, or ourselves, was our way to start conversations. We still want to start those conversations, we just want to make sure to do it in a way that isn’t hurtful to our autistic friends. And so we searched for another way. I talk a lot about my frustration with what I call Cocktail Party Awareness. The most prevalent kind of awareness out there, it is far more a validation that marketing works than an assurance that anyone is actually trying to help autistic people to live a better life. Associating puzzle pieces with autism doesn’t help my child. Recognizing autism so that you can actually help to accommodate autistic people does. Being able to rattle off the latest CDC prevalence rates doesn’t make the world safer for my daughter. Understanding that her challenges don’t diminish her worth as a human being does. Lighting a building blue may tell us all that autism exists, but it doesn’t help us understand what it is or how we can help to support those who live life through its lens. It’s the conversations that matter. I love the idea of the t-shirt, and highly encourage you to buy one, especially since they’re donating the proceeds of sales through April to ASAN, but the truth is, it just wasn’t quite what I was looking for. I am thrilled to unveil Diary’s Wearable Conversation Starters. The collection is starting small, with just five t-shirts for now, but I anticipate new additions throughout April as, no matter how hard I try, I can’t seem to get my brain to stop coming up with more ideas. 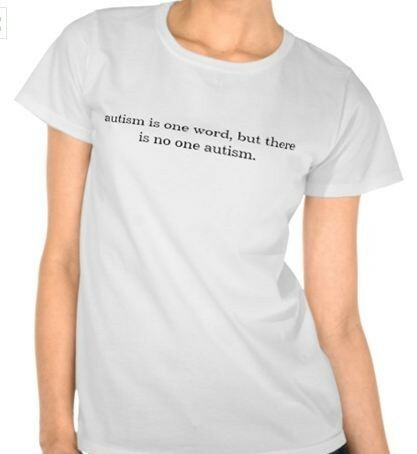 Here’s the little marketing spiel that I wrote for the Zazzle store ..
April is Autism Awareness month, but being truly aware takes a lot more than knowing the latest statistics. Let’s start a conversation. One at a time, we’ll change the world. Don’t forget to customize your shirt – blue, gold, or anything in between. Be you. Be proud.Wear the change you wish to see in the world. And there you have it, friends. The Diary solution to what to wear in April. Because it’s never been about colors or puzzle pieces or brightly colored bulbs anyway. It is and always was about people. And the only way we’re going to change anything, really truly change anything, is one heart at a time. Grab a t-shirt (or a sweatshirt or a hoodie or whatever makes you happy) and let’s go start some conversations. Beginning today and throughout the month of April, a portion of all net proceeds will be split evenly between the Autistic Self Advocacy Network, the Doug Flutie Foundation, and Miss Alysia’s Playhouse, better known as SenseAbility Gym. Thank you and happy shopping! I love this idea. I love these shirts. And I love you. Thank you. Thank you. Thank you. I love these. 🙂 And helping the charities you listed is just the proverbial icing on the cake!! My son said he loves shirt number 1. I think that’s the shirt I’ll be wearing! Love them all! b.r.i.l.l.i.a.n.t. – I especially like “respect the stim.” Well heck, I especially like the creator! Well done. Rockstar !!!! You are simply awesome and I will be ordering for my family of six!!!! Love love love you!!!! I actually chose it very carefully to ensure that it’s readable – I didn’t want it to be too big, but very clear. So that’s why it is what it is. Out of stock? I didn’t even know that could happen! Please check back in the next couple of days. I’ll be adding more. Great idea. We will be ordering! This feels a little weird. you selling to us. After April, what charities will the proceeds be going to? I haven’t thought that far ahead. I may stick with the same ones or narrow it down a bit. No idea. Would something related to “Behavior is Communication” work as a shirt…? Jess, the last few springs I’ve been looking for merchandise like this for Autism Awareness month, and there hasn’t been anything out there that spoke to me like the commentary on your shirts. Good for you for filling a void and having the gumption to follow through. Personally loving “nonspeaking does not mean having nothing to say” as I think of Justin. I’ll be adding one of these to my wardrobe! Great idea, Jess. Any chance of t-shirts in children’s sizes? Can you put these sayings on a pin, hat, or something other than a t-shirt? (I can’t wear the shirt to work, but I can put a pin on my bag and have it all the time). Thanks and good luck. Gonna work on exactly that over the weekend 😉 thanks! Excellent. (And I found the kids sizes when I pressed the “see all styles” button, not “select a size” where I was looking. oops.) Thanks. Maybe not direct enough to start conversations about autism though. April 2. Every year I dread that day. It’s Autism Awareness Day. Media always makes a big deal of it, running specials and documentaries, and several people will tag me in a post or send me an article that they hadn’t seen before, wondering if I’ve ever noticed it. And recently my kids had an Autism Awareness Day at their school. Did it change anything? After talking to them the answer is a resounding “NO”. It’s no longer about awareness, it’s all about ACCEPTANCE and INCLUSION. I have been struggling to find the right words for my post, but honestly Jess from A Diary of a Mom is just so much more eloquent than I am when it comes to this stuff. Thanks Jess for de-tangling the words for me! I wanted to reach out to you and let you know that I love following you on facebook and these shirts are SO awesome, I plan on purchasing one or more asap. I am a high school teacher in MA that was hired last year to start an autism program within the walls of a public high school. It’s a district wide program that has been going on for many years and I am feel nothing less than blessed to be the one that gets to extend this program onto the high school years of these students. I love my job. Some days more than others, but I am truly blessed to be able to say that my job is my passion. The reason I am reaching out is not only to tell you that your words have been inspirational and helpful, but to also let you know of an opportunity that I get to be apart of this month. My school has one of the top student run TV programs in the state and I asked them to do a “spotlight” episode on our ASD program to showcase my students and how well they having been doing in their new school and program. They have done an autism awareness episode in the past, however when I watched it I felt like even though they got some facts accurate, the entire episode had shed such negative light on what autism actually is. I am so happy that I have the opportunity to turn it around and really spotlight my individual students and how awesome they are as people first. I want to spread the word that it is awareness and understanding lead to acceptance and love. Not tolerance. This episode will be watched by the 1300 students in my school along with the 150+ staff members. I want the message that I send to reach them and stick with them. I have high hopes to make this program a model program in the state, and with people’s support and understanding, I know we can do it. Thanks again for your ongoing inspirational messages. Your positivity reaches more people than you know. If there is anything that anyone wants to share that can help me with this message, I would love to hear it and appreciate any positive feedback. Thank you for these Âûsome shirts. I have just bought the non-speaking one. I ordered blue by accident and then I realised how powerful it is to have a blue shirt with that message on it. I found it hard to decide which colour as the darker colours did not show up the text on-screen, unfortunately. That’s ok. Blue is powerful with the non-speaking message on it. I am autistic and speak most of the time. I do have times where I can’t speak and feel so vulnerable. I wear this shirt to help others think outside the stereotype of autism that is portrayed by the media. « like it? i love it!